Sparksey4869 Model Trains: SDS Tanker. As I am a lover of tankers, I decided to purchase a couple of SDS tankers at the Armidale Convention from Gwyder Valley Models. They are a very nice model indeed, well detailed and a fair price. The only down fall to them I believe is that they are too light and clean!!! I added some shot gun shot to the tank, glued in with white glue. I prefer to fill by feel rather than follow the NMRA guideline of weighing wagons according to length. I like a heavy feel and think that the locos should work. Now to the weathering. I referred to photos of a tanker in the 80's, as that's the era I model. Firstly, I airbrushed on some grimey black. 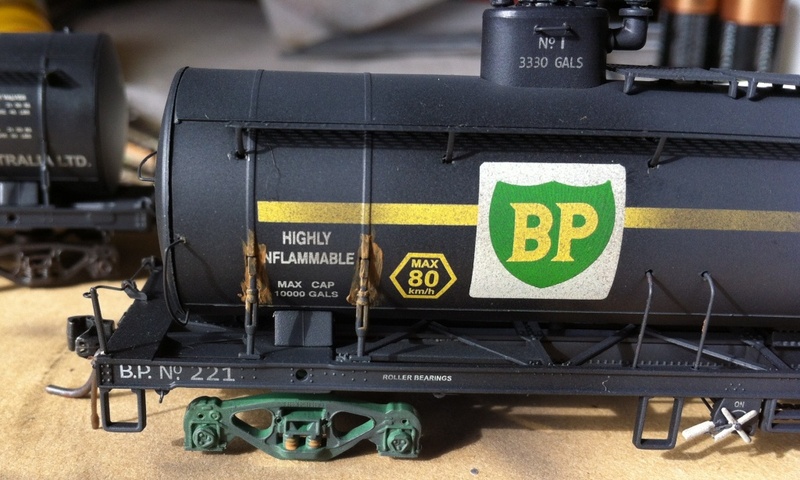 Next was to dry brush some rust around the tank straps and bogie springs. Then airbrush on some more rust on the main tank area. Then using some gloss black, I brushed on some oil/spill marks around the fill are of the domes. Then of course spray the model with Dull coat to seal and tone down the rust.